When your custom wire forms and perforated sheet metal pieces need to be free of potentially harmful sharps and other deformities, Marlin Steel offers deburring services on custom-manufactured parts. Mechanical burrs can happen from shearing, punching, and drilling. 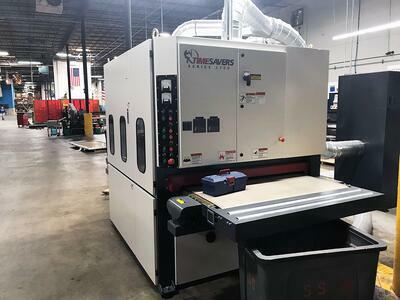 Whether it's a decorative finish, a high gloss polish, oxidation, or rubber grinding, our Timesavers 2200 deburring machine can be configured to suit your specific need. One way in which Marlin Steel reduces the occurrence of burrs and sharps is to weld parts with an advanced medium frequency welder machine that leaves fewer deformities from welding than a traditional welder. Beyond minimizing the occurrence of deformities in the first place, Marlin Steel uses the Timesavers 2200-Series dry deburring machine. Unlike a wet belt sander, this machine doesn’t use a lubricant to cool the metal parts being deburred. This makes the 2200-Series run hot, but also eliminates the need to collect, sift, and recycle lubricant. This machine's dry-mode deburring strips the excess metal from a custom metal form, leaving a smooth surface that is free of burrs and sharps that could pose a hazard to parts and users alike. 1-3 drum or bash type head(s) with a 30 HP motor. 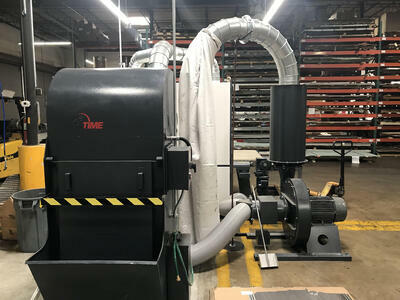 By adding this machine to its list of deburring options, Marlin Steel is expanding both its capacity and options for deburring parts to meet client specifications. To further improve the finish of a metal form and remove microscopic flaws, the metal form can be electropolished to eliminate the tiniest of flaws.